When David Tennant left the TARDIS back at the end of 2009, his big exit was contrived, over the top and entirely misjudged. What should have been a farewell to a much loved Doctor instead was twisted into becoming an almost unbearably loud goodbye from showrunner Russell T. Davies, who also parted with Tennant. "Twice Upon A Time" marks the first time Doctor Who has bid farewell to both a Doctor and a showrunner simultaneously, and fortunately it makes the moment count. As a showrunner, Steven Moffat has had his issues. His plots have frequently veered so far into confusion that they don't quite make it out the other side, and his handling of Matt Smith's final series was questionable at very best. But here he shows restraint, allowing the episode to not be about him waving goodbye, but about Peter Capaldi strutting his stuff around the TARDIS console room one final time before handing over to the next incarnation. Moffat brings Clara back for one brief moment, but smartly doesn't let her take control of the scene - it's nice to see her again, what with Clara being my favourite companion character and all, but the episode quickly spins back to focusing on Capaldi and the people he actually has in front of him before he decides whether or not to regenerate. We're getting ahead of ourselves here, let's jump back a bit. After the events of "The Doctor Falls", the Doctor finds himself on the South Pole fighting back his regeneration when he's stumbled upon by, well, himself. 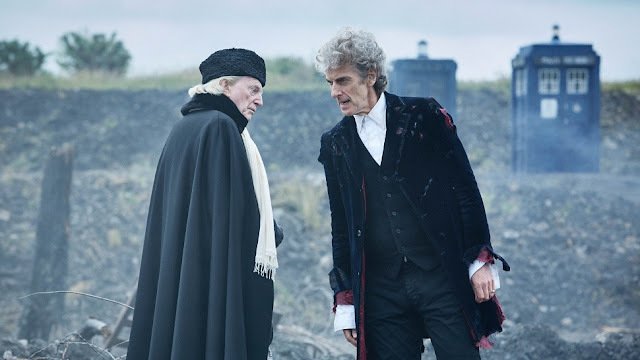 The First Doctor (played brilliantly here by David Bradley) is also trying to defy his own regeneration, and as the two try to come to terms with what appears to be happening a random WWI soldier (Mark Gatiss) staggers into the playing field. Pulled from a moment in time that surely would see his death by the hand of a reluctant enemy soldier, the man asks if either of the two gentlemen he finds before him is a doctor. And we're off. What follows is an episode less concerned with plot than it is with character, and with pulling all of the main thematic ideas that surfaced across Capaldi's tenure into the limelight for one last adventure. "Twice Upon A Time" deals with kindness and regret, with how to handle oneself in the face of uncertainty. Bill is back, but it's not really Bill, but it is really Bill. More, it's Bill's memories removed from her physical body and placed inside some form of glass-like avatar to preserve her after her death. It's a smart way to bring Bill back into the picture, keeping the power of her departure earlier in the year intact without stretching many sci-fi boundaries either. We spend a lot of the episode's first half following both Doctors plus WWI soldier plus Bill trying to find out what sort of evil plan these glass avatars are concocting, only for the Doctor to learn - from Rusty the Dalek, no less - that there is no evil plan, only good intention. What better way to revisit the Capaldi era's focus on kindness than have a finale with no real villain? We ultimately return to the WWI battlefield where our soldier willingly accepts his death with the knowledge that all he has just experienced will be wiped from his memory, but then something beautiful happens. The Doctor has brought the soldier back to the moment of his death, but he's played with the timelines a bit, returning him to the very moments before the famous 1914 Christmas Truce in order for his life to be spared, even if just for a day. As our soldier points his gun at his enemy, both of them unwilling to do what they know they're meant to do, a song breaks out from both sides of the trenches, and the two opposing armies come together to form a day's peace. Moffat's script never overplays the moment, understanding how beauty and kindness can come even without words. He lets the power of song take control of the scene, with Rachel Talalay's gorgeous staging and direction of the sequence adding to the emotion behind it. Kindness is what Capaldi's Doctor has stood for the most. In Series 8 we found him hiding from kindness, refusing to both accept it and omit it. Series 9 saw the Doctor begin to embrace kindness, finding companionship with Clara Oswald, before Series 10 finally let our Doctor put his new found heart and soul on full display to everyone around him, on either side of the battle. The Christmas Truce is a moment of pure brilliance within the episode, allowing Capaldi's swansong to both recapture all his arc has built to as well as giving the episode a suitably Christmassy tone for this time of year. The Doctor bids farewell to his younger self, who now accepts that regeneration is what he needs to do, but before he can go and regenerate himself there's some people he needs to say goodbye to. Bill expresses her longing to be a part of the Doctor's life forever, even though she knows the impossibility of such a life, while Clara and Nardole pop in for small goodbyes too. It's a series of touchingly understated moments, but ones that find genuine heart in their quietness. It never feels like a tour of Moffat's era, only a summary of Capaldi's journey. The real volume comes shortly after, as Capaldi is allowed one final monologue before his face and hands erupt into the iconic orange explosion. The monologue - set, quite brilliantly, to the music from "Heaven Sent"'s climactic moments - takes us through the Doctor's thematic narrative, from laughing hard to running fast to, obviously, never eating pears. It's a big moment, and Capaldi brings his usual gravitas to the sequence without feeling overbearing. He has a way of making even the most gimmicky moments feel earned, and as he commands the TARDIS one final time, it's tough not to feel a sense of regret that he can't stay for longer. His final episode is a great one, though, and it's now to time to hand the reins over to someone else. Do you know what? I think she could be pretty special indeed. As well as being Moffat and Capaldi's farewell, long serving composer Murray Gold is also leaving the show now. "Twice Upon A Time" rather beautifully gives him a background tour of his greatest works, with that iconic Doomsday music popping up early on, as well as a number of early year classics. That's a nice touch. I've said it before and I'll say it again, I really hope Rachel Talalay returns to direct plenty of episodes in the Chibnall era. Her work during the battlefield scenes is stunning, and I really liked how she made the Testimony's ship look similar to the "Heaven Sent" castle - both her and the show's greatest accomplishment. I'm glad Mark Gatiss got another acting job before he, likely, leaves the show too. "The Lazarus Experiment" should not be the episode he's remembered for. Lots of great humour throughout the episode. Capaldi's "Are you having a laugh?" at the very beginning was pitch perfect, and Gatiss' delivery of "I'm used to rats" before that Dalek creature attacked him was hilariously funny. I'm not really sure all the sexism jokes worked, though. They're easy to make with the current political climate, but the First Doctor is a Timelord from Gallifrey, not a 60 year-old man from Earth. Didn't the Doctor tell Bill that Gallifrey didn't have gender roles only a few episodes ago? Hmm. I have absolutely no idea how the next series can begin, but I'm excited about this show in a way I haven't been for a while now. Series 9 remains my favourite year for the show, but it was rarely an exciting series, just a more mature and thoughtful and powerful one. I hope Chibnall can bring the fun, exciting, childlike wonder back to Doctor Who. Peter Capaldi, you've been truly great. Thanks for being my favourite Doctor, and by far the strongest actor to ever play the part. Jodie Whittaker, all the best. I can't wait to see what you bring to the role next year. Awesome review there. Completely agree that it was a fitting send off for Peter. Loved his final speech. That's one aspect I loved about Capaldi's Doctor, his speeches qere brilliant.